THE VARSITY CROSS-COUNTRY TEAM gathers together after finishing second place at the CIF Division II State Championships. The team finished with only 27 seconds between their first and fifth runner. 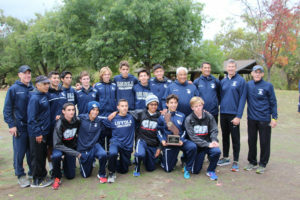 The varsity cross-country team, defending Division II State Champions, placed second at the CIF State Championships in Fresno, California, on Saturday, Nov. 26. Led by head coach Lalo Diaz, the Cubs lost by 10 points to Claremont High School, 97-107, in a field of 23 Division II schools. West Ranch High School finished third with 140 points. Across all divisions, Loyola finished fifth in the state. Seven days earlier, the team toed the line at CIF Finals at the Riverside City Cross Country Course, where the runners faced the top teams in the CIF Southern Section. After finishing fourth last year at CIF Finals, the Cubs repeated their performance as they placed fourth this year with 143 points. Ventura High School ran away with a win and a CIF-SS Title after finishing first with 98 points. 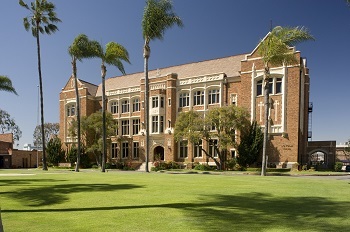 Mira Costa placed second with 127 points, and Claremont finished third with 129 points. The team was led by senior Charlie Sherman who finished sixth with a time of 14:59 on the three-mile course. Diaz said he expected the Cubs to finish either first or second, especially after their first-place performance a week earlier at CIF Prelims, which was held on the same course. Had the Cubs run identical times to their CIF Prelims performance, they would have finished second, only seconds behind Ventura. Diaz believes over-strategizing in preparation for CIF Finals may have been a factor in the team’s fourth place finish. In preparation for the state meet, Diaz added freshman Anthony Stone back into the lineup after recovering from a minor injury earlier in the season. Diaz said his goal was to finish “under the tent,” alluding to the awards tent; however, some runners knew the team had higher ambitions . In the final minutes before the State Championship race began, Diaz gathered his runners in a huddle and encouraged them to “go out there and have fun,” despite the pressures of a state title. After the first mile, the Cubs were in third place with 122 points. Claremont held the lead with 96 points followed by Dublin High School with 115 points. After two miles, the Cubs moved into second place with 121 points. Claremont remained in first place with 94 points, and West Ranch improved to third place with 137 points. The top five scorers for Loyola averaged 15:53 for the 5K course. With only 27 seconds separating the Cubs first runner to their fifth, Loyola recorded the smallest scoring gap of any team in the race. Bissell finished first for the Cubs and 18th in the race with a time of 15:44, followed immediately by Sherman with a time of 15:45. Senior Alejandro Salinas finished third for the team and 23rd overall with a time of 15:49. Junior David McAndrews finished two seconds later in 26th place. Junior Brandon Cobian finished as Loyola’s fifth man and 62nd in the race with a time of 16:11, beating Claremont’s fifth runner by one second. Junior Corey Kumamoto finished in 16:14, and Stone in 16:29. In a results lists that combined all boys teams from all five divisions, Loyola finished in fifth place with the smallest scoring gap among the top eight teams. Loyola will graduate only two seniors out of the top twelve runners on the team, leaving an experienced group for next year’s season.